I say ‘referred myself’ because I could hardly have further confused the students by referring them to the quote. 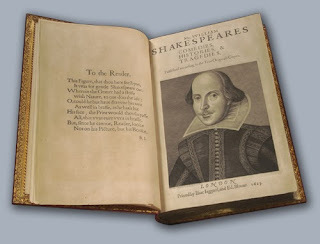 For them it had to be the works themselves, or the particular play we were studying, that I would take them through and make some attempt to convey the effect of all that asymmetry and the elusive appeal that has enticed generations of readers – as well as playgoers – over the centuries. In spite of my understanding - and to some extent subscribing to - the modern view that ‘the play’s the thing’ and what happens on stage is what is important, I also have a personal empathy with those like Charles Lamb who suggested that a play like King Lear can only really achieve its full effect when played on the stage of the mind. Or Hazlitt, who said of the same play that "All that we can say must fall far short of the subject, or even what we ourselves conceive of it." And that’s just it. He sets his own terms and performs the mystery of making it all work. Wittgenstein goes a bit further than this and justifies his ‘dream’ comment by saying that the plays “create their own language and world [which] is completely unrealistic”. But if this is a dream, it is one that we are all drawn into. Or, in the case of those that don’t ‘get’ it, not drawn into. But, like actual dreams, it is a dream that interrogates reality rather than attempts to escape from it. Shakespeare casts a spell to which some are immune. But I would not for the world be among them. That scene at the end of The Tempest where Prospero casts his staff and his book into the waters is much more than a metaphorical farewell to the playwright’s craft. It really is a renunciation of magic.